Fitbit has replaced the Charge HR as their flagship fitness wearable, but their newest technology may be falling short of expectations. The Fitbit Blaze is an improved watch that will undoubtedly influence the future of practical wearable technology, even if it underwhelmed commentators and investors. The Blaze is available for preorder today, so we’re going to break down its essential features for any potential buyers. Like all of Fitbit’s products, the Blaze is centered on fitness. It will measure heartrate with Fitbit’s proprietary PurePulse system, which uses the same LED sensor technology as virtually every heartrate-monitoring watch. But be wary; a slew of journalists and experts have questioned the accuracy of wrist-based monitors, especially when the user has an elevated heartrate. Heartrate accuracy is probably the biggest hurdle in the fitness wearable industry right now, as well as the technology’s strongest selling point. It’s somewhat disappointing that the newest Fitbit doesn’t promise more accurate readings. Fitbit is trying to compensate for that with the Blaze’s new multi-sport mode, which tempers PurePulse to the kind of workout the user is performing. However, the base technology needs considerable improvement before catching up to the reliability of chest-based monitors, which are on par with EKG readings. But, as a redeeming quality, the Blaze offers far more than heartrate monitoring. The biggest improvement to this watch is the screen, which is far larger than any other Fitbit display. And it’s Fitbit’s first high-res, color touchscreen, which will give users an interface comparable to other non-fitness related wearables. That larger, more useful screen will also show some major software innovations. Like the Microsoft Band, the Blaze will display on-screen workouts that users can follow anywhere, even without a Wi-Fi connection. Users will also have access to sleep quality metrics, a pedometer, GPS (connected through the user’s phone) and a 5-day battery. The Blaze will also notify users to incoming calls, texts, calendar alerts, and battery notifications. Those features are becoming standard in almost every wearable watch, so Fitbit faced some significant peer pressure to include them in the Blaze. And I can’t deny that this is Fitbit’s sleekest, sexiest piece of technology. Unlike other Fitbit watches, the Blaze can change straps – a cue taken from its biggest competitor, Apple – and the leather, stainless steel, and elastomer straps are all stylish enough for the office. They come with a hefty price tag, though, and may not be worth the extra $30-$130. The Blaze is available for preorder, and retails at $200. It’s also being premiered at CES, which opened today, so expect some hands-on reviews very soon. Here’s the takeaway: The Blaze is probably going to be an elite and popular offering, but Fitbit has only consolidated existing wearable technology into one device. Will the Blaze revolutionize the fitness wearable industry, like the Charge HR? Probably not. 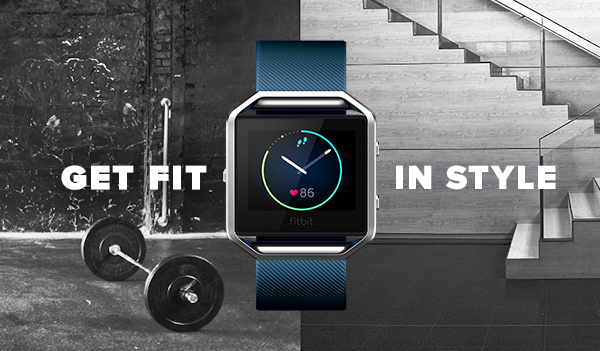 It feels like Fitbit is trying to catch-up rather than innovate. But Fitbit has brand recognition, a strong name in the industry, and the ability to take some risks in the future. Maybe the Blaze will provide the platform from which Fitbit will jump into the next generation of fitness tech. Until then, it seems like a decent consolidation of fitness wearable tech.